The major opposition party, APC witnessed major violence yesterday at the secretariat of the Convention Committee, Abuja. According to vanguard newspaper: Two APC members were beaten up by some delegates of the party from Abia and Ebonyi states while policemen looked on. One of them who was labeled as “Ngige boy” was stripped naked near the secretariat along Emeka Anyaoku Street, Area 11 Abuja. Investigations by Vanguard revealed that the fighting erupted between delegates of different factions of the party from Abia and Ebonyi States. 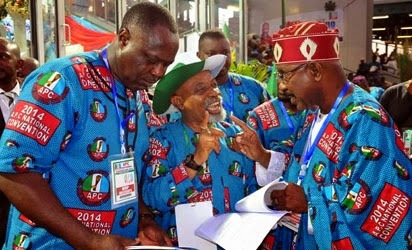 Some of the aggrieved delegates from both states who spoke to Vanguard alleged that although they were democratically elected as delegates for the party’s convention, they had been denied accreditation by the Convention Committee headed by Sokoto State Governor Alhaji Aliyu Wammako with Senator Chris Ngige as secretary. One of the delegates from Abia State who identified himself as Uche Emeka accused Ngige, Imo State Governor Rochas Okorocha, former National Chairman of All Nigeria Peoples Party, Dr Ogbonnaya Onu and National Vice-Chairman of the party for the South-East, Mr Nyerere as being responsible for their plight. ”We were reliably informed that Ngige and Okorocha have instructed that our Chairman who is Fabian Okonkwo and the rest of us from Abia State should not be accredited. ”We have been calling to inquire and we also have it on good authority that they are directly responsible for this. Our state chairman, has been making calls to find out what is wrong, but no answer has been provided,” he said. Another delegate from Ebonyi State who identified himself as Christian Ali, told Saturday Vanguard he was the secretary of the party in Ishielu local government. He said,”There are two factions of APC in Ebonyi. One is led by Chief Ogbonnaya Onu while the other is led by Senator Julius Ucha and because of that, there seems to be a power tussle between the two of them.